The image above is one of the two photographs that were merged. Both had the same exposure (Nikon D800E on tripod with 70-200mm f/2.8 lens extended to 70mm; 1/6th sec. @ f/2.8, ISO 1600). The reason for the high ISO and wide-open aperture is the moving boat in the river. Highlights: Decrease to -39; Shadows: Increase to +45; Clarity: Increase to +18 Vibrance: Increase to +14. The two images were then opened in Photoshop and processed through the Photomerge routine. The screen capture above shows the command sequence which is under “File” on the main command line of Photoshop. 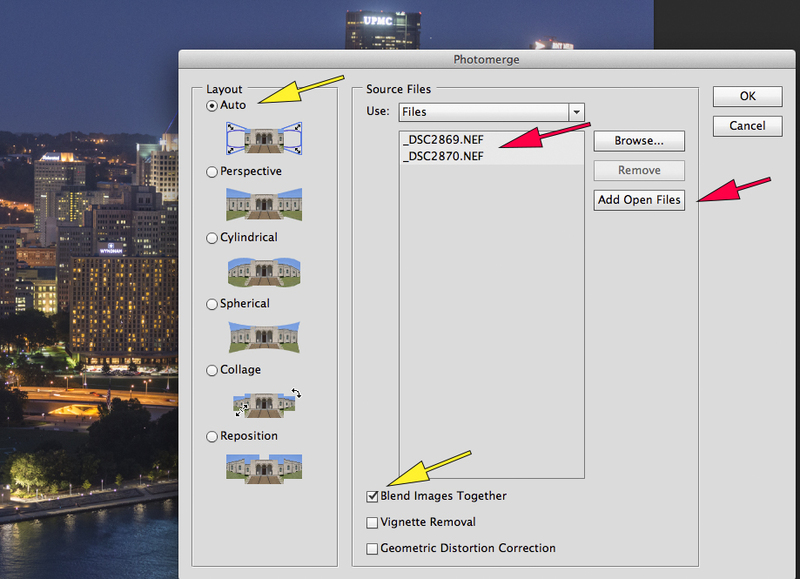 After clicking on “Photomerge” (red arrow), the Photomerge Dialog window appears as shown below. 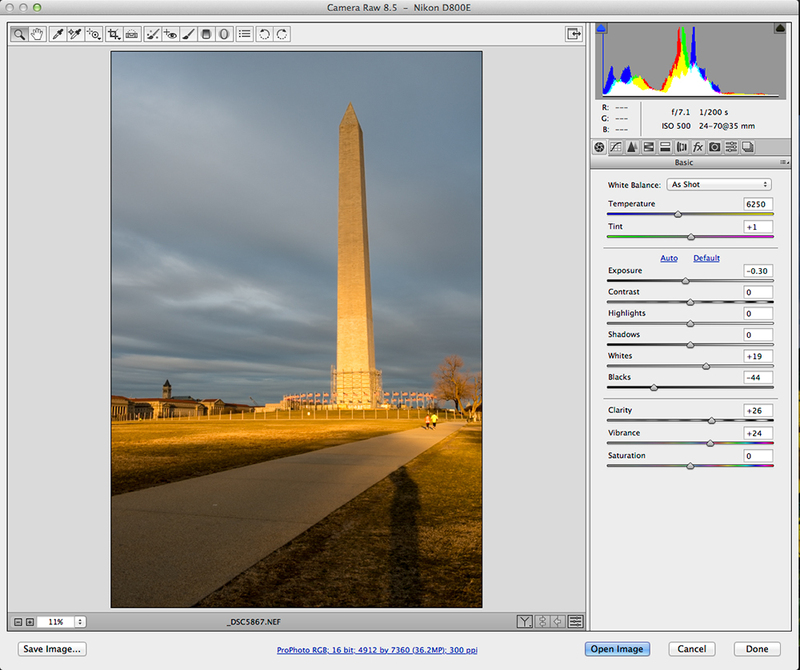 The screen capture above shows the dialog window for the Photomerge routine. 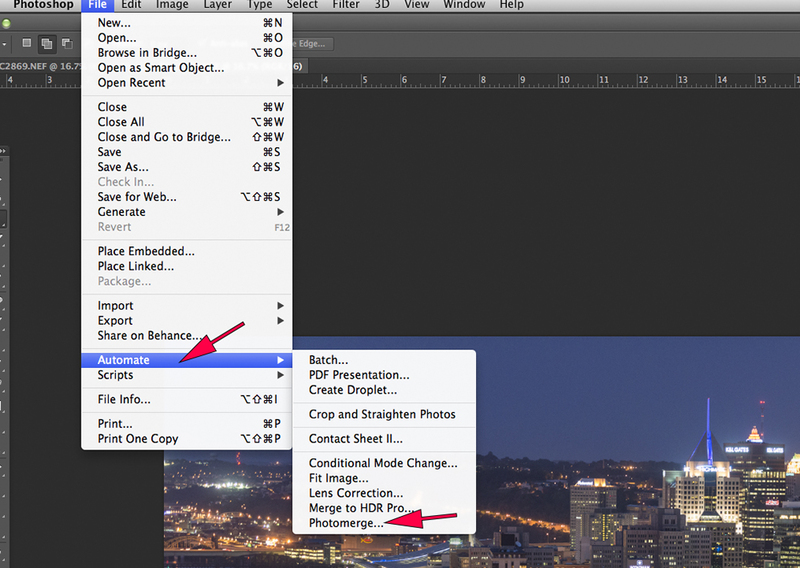 If the images are open, click on “Add Open Files” (red arrow) and the image files will be listed (other red arrow). 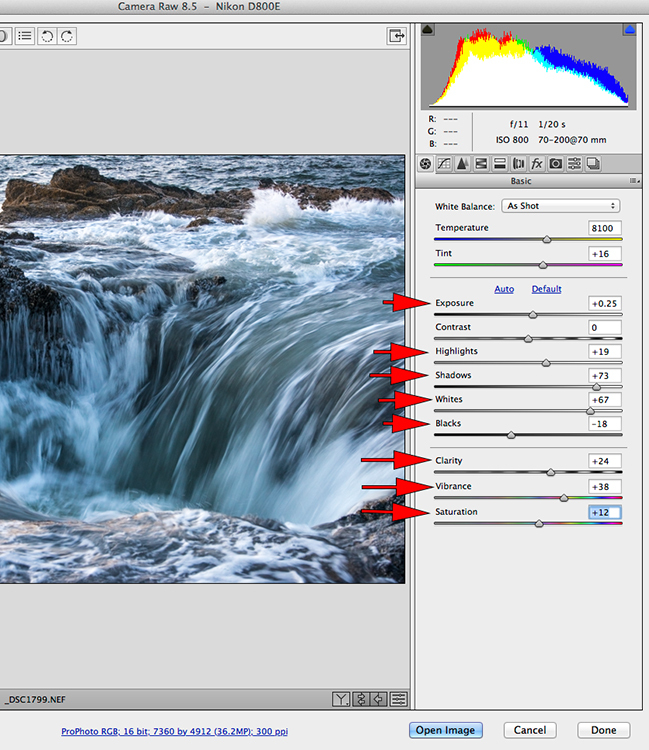 Usually, the default selections of “Auto” and “Blend Images Together” (yellow arrows) will do the job. Click “OK” and the system will chug away for a little while and then display the results. 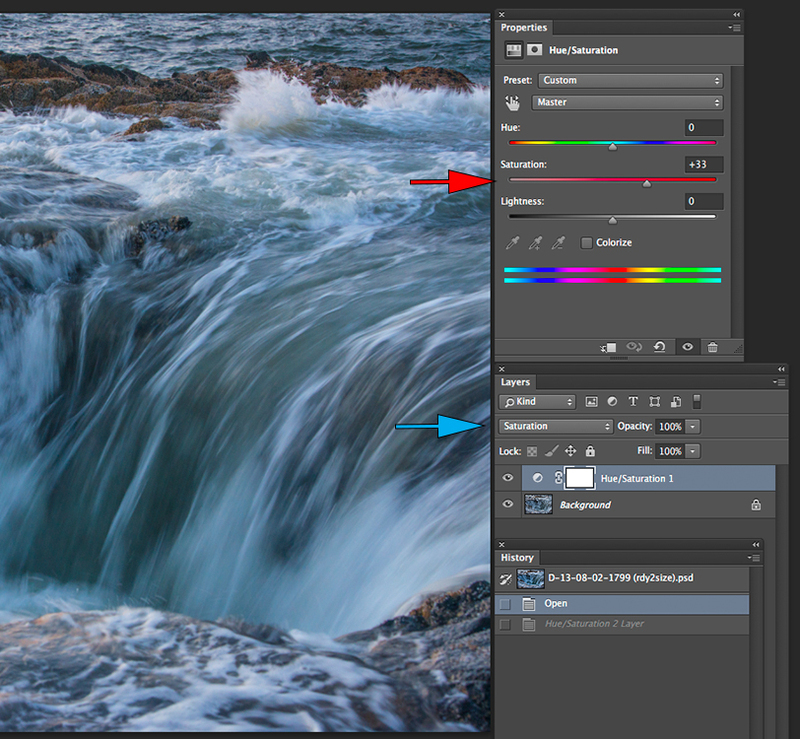 The screen capture above shows a small portion of the merged image and the layers palette (red arrow) showing a separate layer for each image. The white areas in the mask icons represent the section of the image that was used. The blue arrow shows a section of the irregular border created during the routine. The image above shows the full panorama immediately after the merging is completed. The borders are always irregular (red arrows), often much more than shown here. The next step, before any further actions are taken, is to flatten the image. 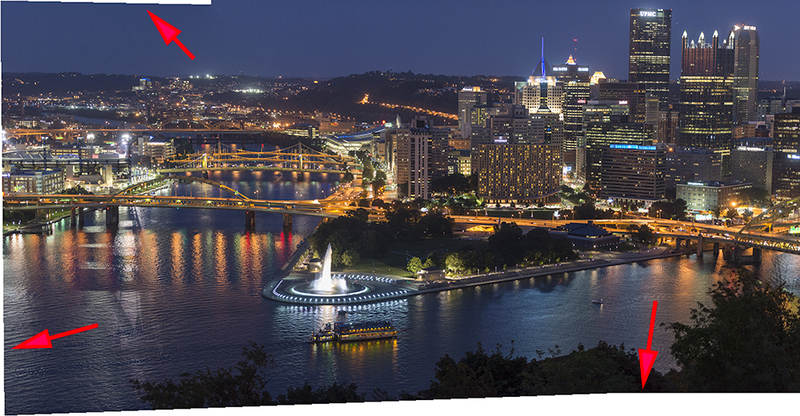 The only remaining step in this example is a crop to eliminate the uneven edges, producing the final image shown below. Sharpening should not be applied until the image is sized for printing. 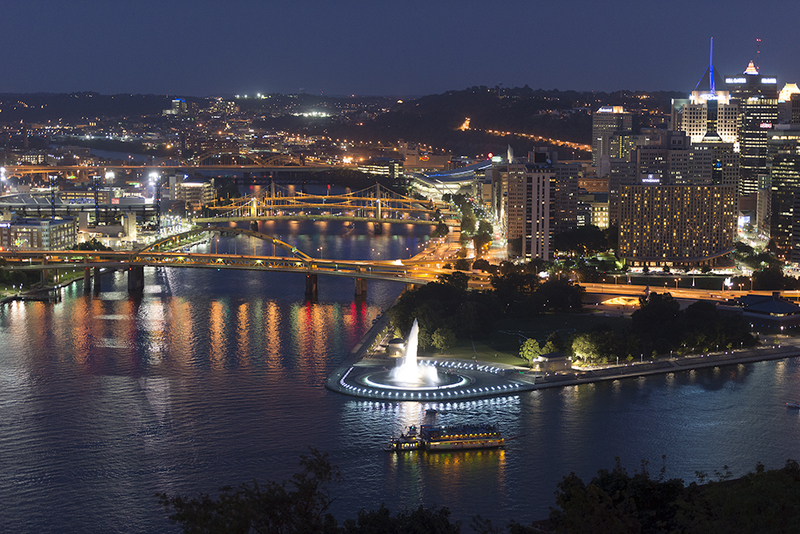 The location for capturing this image is across the street from the Monterey Bay Fish Grotto located at 1411 Grandview Avenue #2 in Pittsburgh, Pennsylvania. It is one of the better restaurants in the city and the window seats boast a view pretty close to this image. 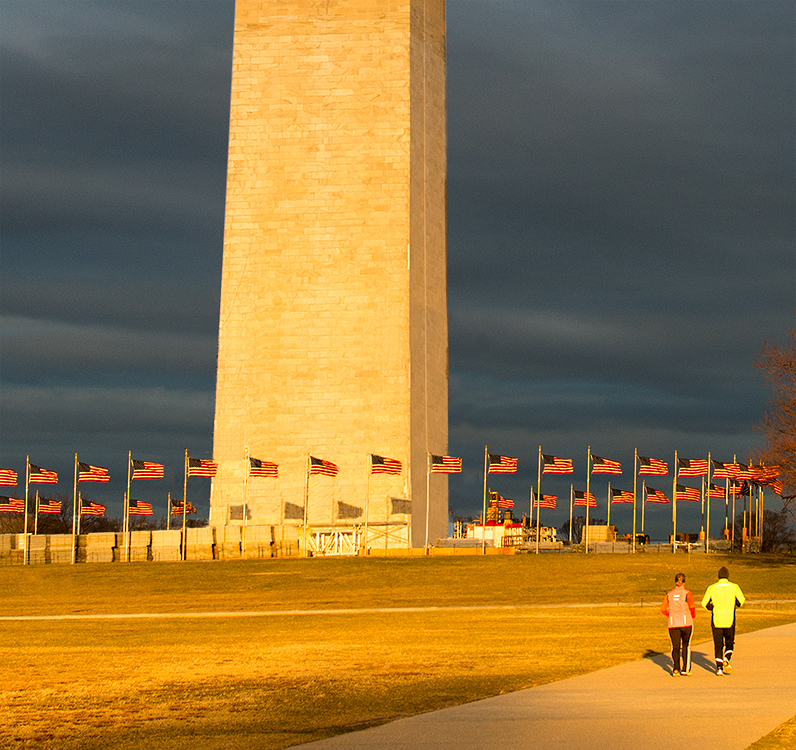 Because the vista is pretty spectacular at twilight, it’s unlikely you will have the sidewalk all to yourself. 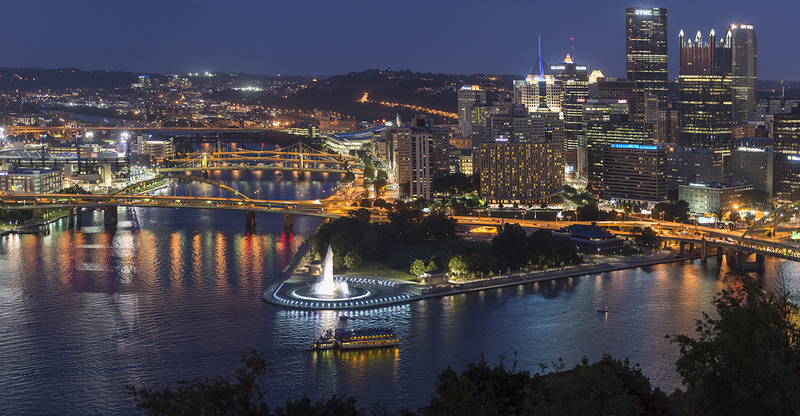 But if you are visiting Pittsburgh, this is a location you may want to check out.But before you go there, you should check out the other submissions to Week 19 at Visual Venturing. It was an excellent evening for a shoot. 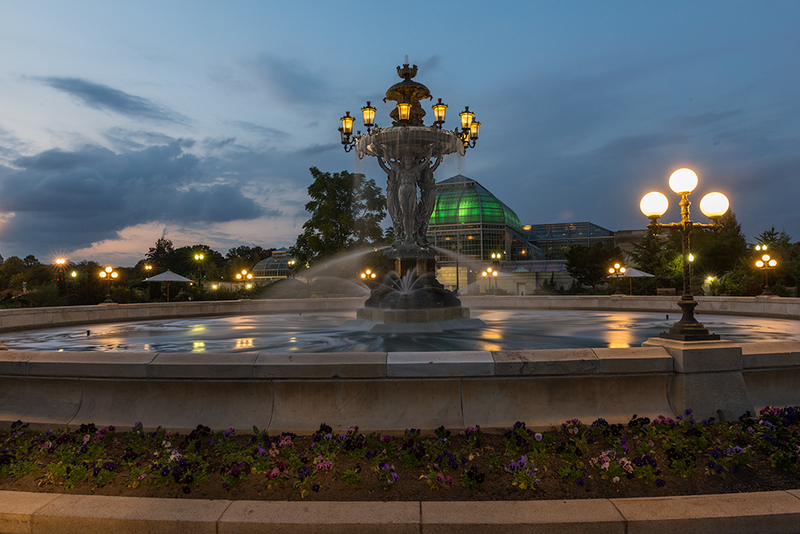 The weather was perfect, the fountain was illuminated and flowing normally, a fresh bed of pansies had been planted in the circular plot, creating a floral necklace around the basin. 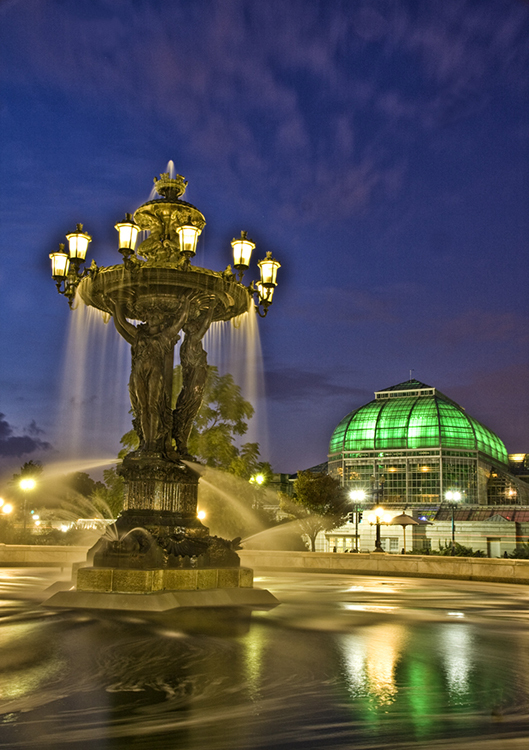 The glass dome of the Botanic Garden across the street was being illuminated from within by a green light. A few people passed through the park while we there, but we were quite impressed with a group of five (see image at top) who brought in a tablecloth, silverware, sparkling water, an assortment of cheeses, and other good things and had what looked like a wonderful evening as we moved around photographing the fountain. And on nights when there is a moon, clouds are less desirable as shown in the image below taken last year. (Technical data Nikon D800E on tripod with 24-70mm f/2.8 lens @70mm; 3 sec. @ f/16, ISO 800, 5 images photomerged) This could have easily been a single image by bringing the extension back to about 35mm, but the moon would have looked quite small with that approach. 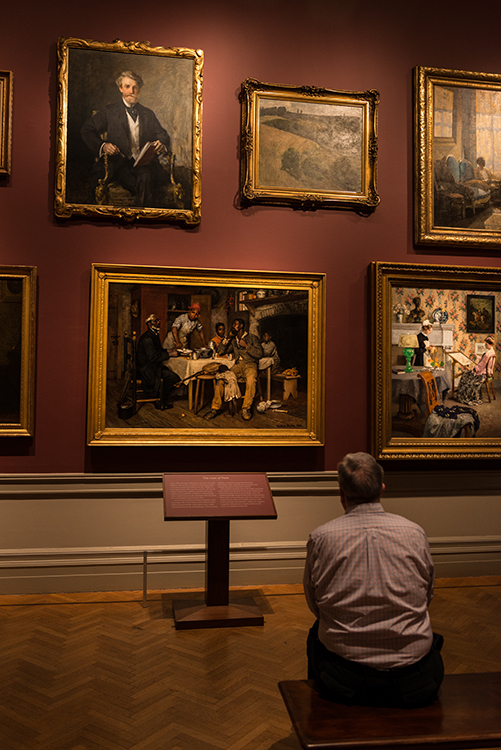 After almost 150 years, the Corcoran Gallery of Art will be closing its doors to the public. Financial difficulties could not be resolved and a major institution will disappear. 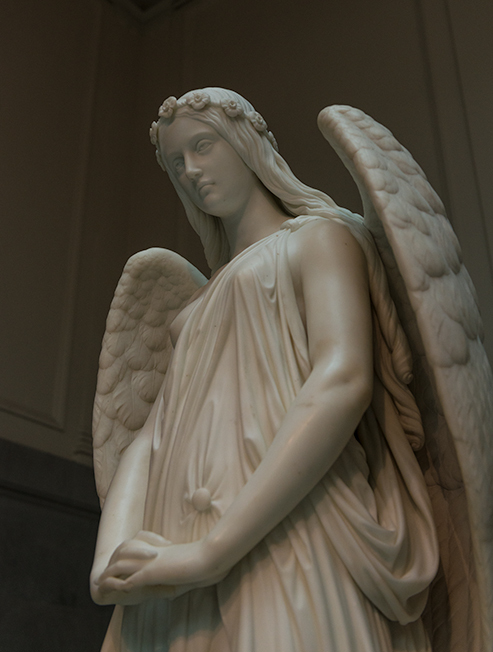 The collection, focusing on American art, will be broken up and scattered to other locations. 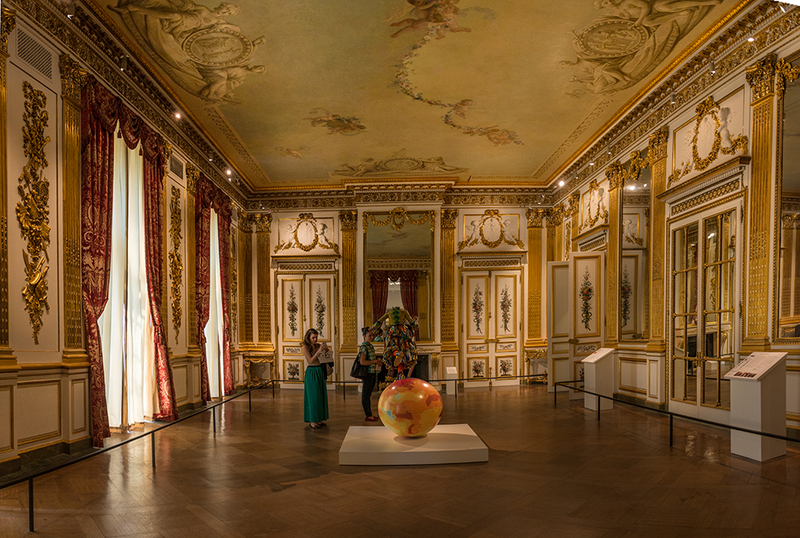 The National Gallery of Art will assume responsibility for the majority of the works, but it is unlikely that the permanent displays now in the Corcoran will ever be seen together again. Sunday, September 28th will be the last day before it closes to begin a renovation that will take about a year. 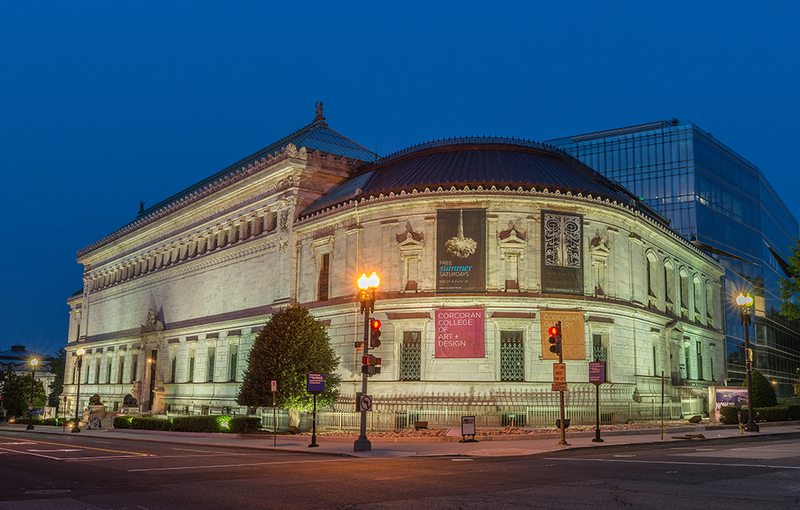 Much of the current exhibit space will be used for an expansion of the Corcoran School of Art which will be managed by George Washington University. I wonder what will happen to the Salon Doré, a room created in Paris six years before Thomas Jefferson wrote the the Declaration of Independence. The Count d’Orsay had it constructed as a drawing room for his bride-to-be. It was purchased in 1904 by William A. Clark for a mansion he was building on 5th Avenue in New York City. 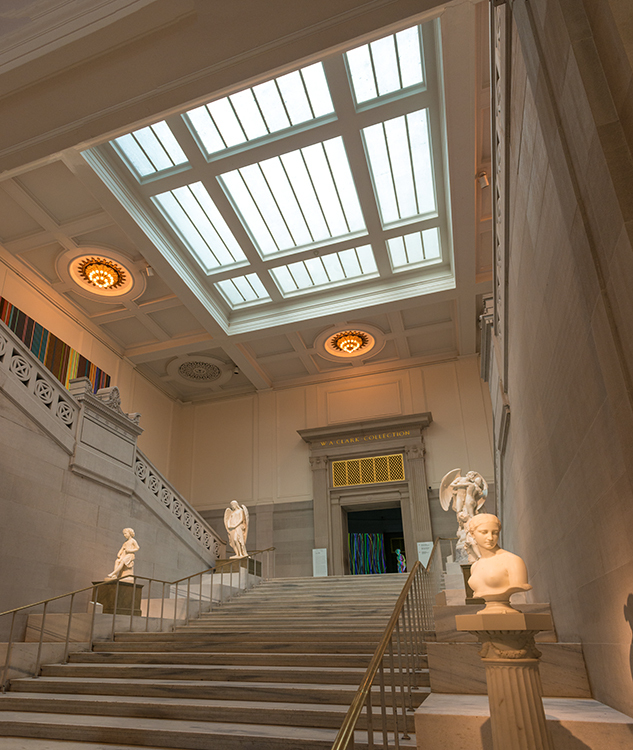 In 1925 Clark donated this room and his art collection to the Corcoran. 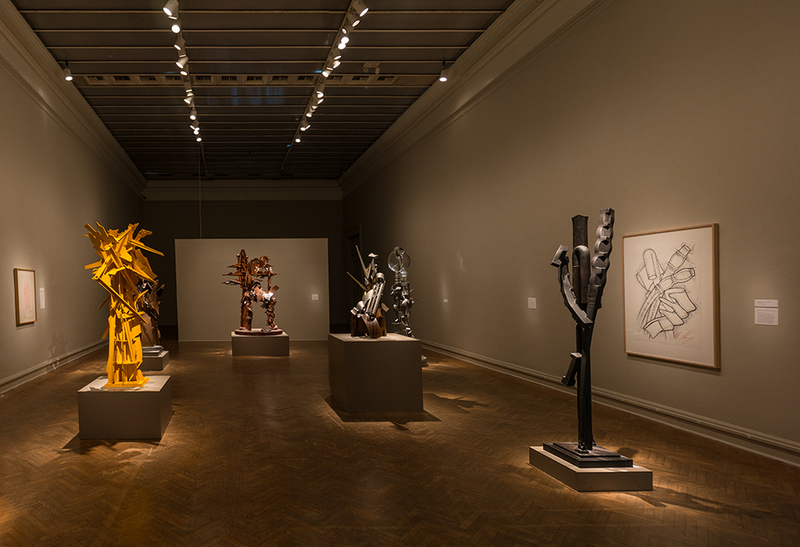 The gallery was not crowded today when I visited this morning. It was hard to walk out the front entrance, knowing I’ll not be here again. On Thursday, I made a quick scouting run into the city to verify that a planned shooting location for the next evening held no surprises. Along the way, I checked the status of other sites that may be of interest to local photographers. 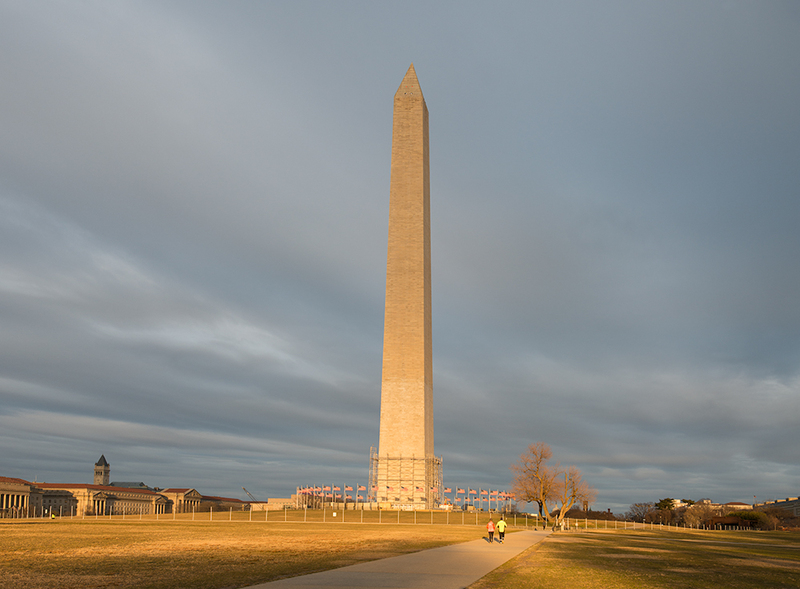 Kennedy Center: A large tent remains installed on the south side of the building, an obstacle for anyone planning to photograph the building from the Theodore Roosevelt Bridge pedestrian sidewalk or from vantage points on that side of the Center. John Paul Jones Memorial: The small water feature on the base of the statue was not operating. It is not a well-known memorial despite its excellent location close to the World War II Memorial at the intersection of 17th Street and Independence Avenue. The White House: A small project is underway to repair a section of the iron fence along Pennsylvania Avenue. The section is small, but efforts to have a centered photograph of the White House and the fountain in the front lawn will be frustrated. However, It doesn’t look like it will be a problem for long. Old Post Office: Also closed, also lots of scaffolding. The Trump organization is busy transforming this historic building into a luxury hotel. U.S. Capitol: Scaffolding is now about half-way up the dome. This will be a long wait, but see the good news below. 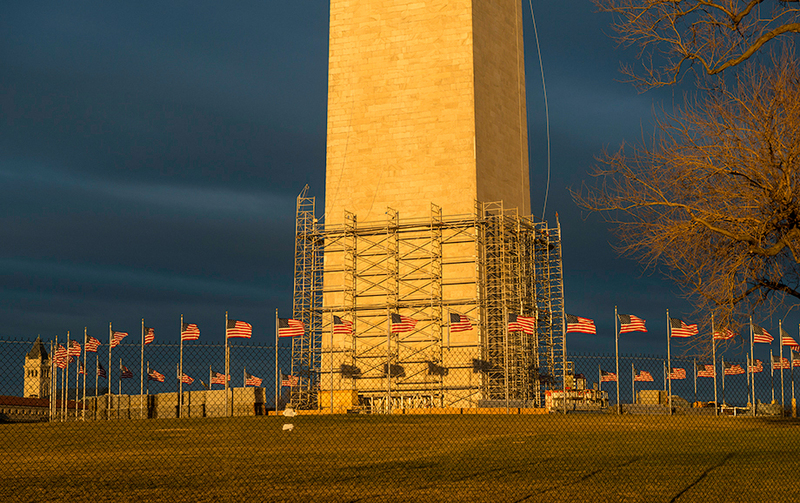 U.S. Capitol: Depending on your taste, there may be some opportunities with the presence of the scaffolding. 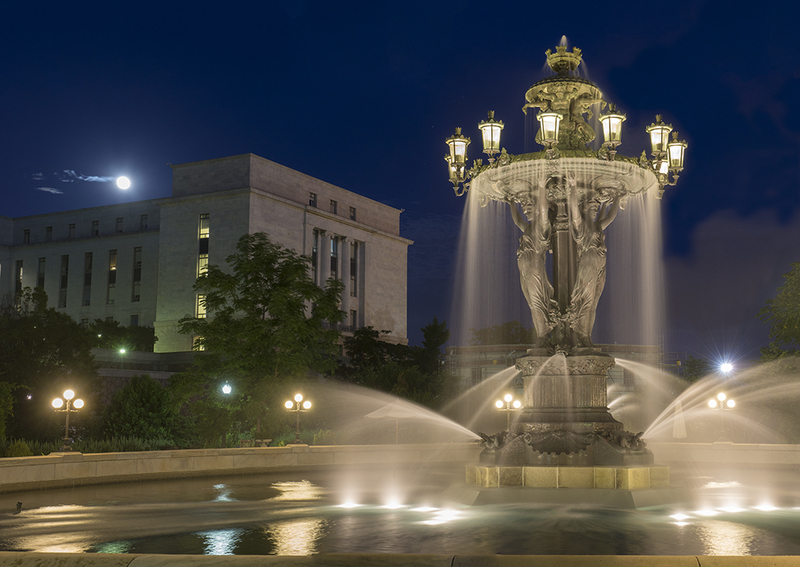 We don’t have the benefit of the elegant illuminated effects that charmed night-time visitors to the Washington Memorial when it was being repaired. But as the night approaches, the dome begins to look a little like a wedding cake. In addition, the dome’s interior lighting is much brighter than usual, probably due to the construction work inside. Take a look, get creative. Court of Neptune Fountain: Fronting the Library of Congress, it was running nicely when I drove by but some of the figures could use a little scrubbing. It appears that some white mineral deposits are appearing. 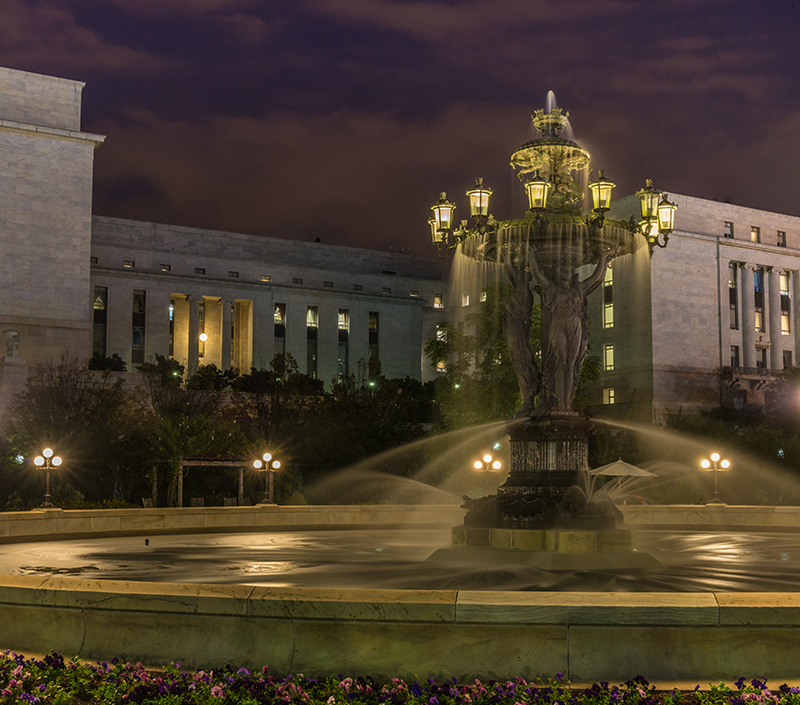 Senate Garage Fountain: Running nicely, but I didn’t get a close look. A great subject for a twilight shot, especially when the light show begins. 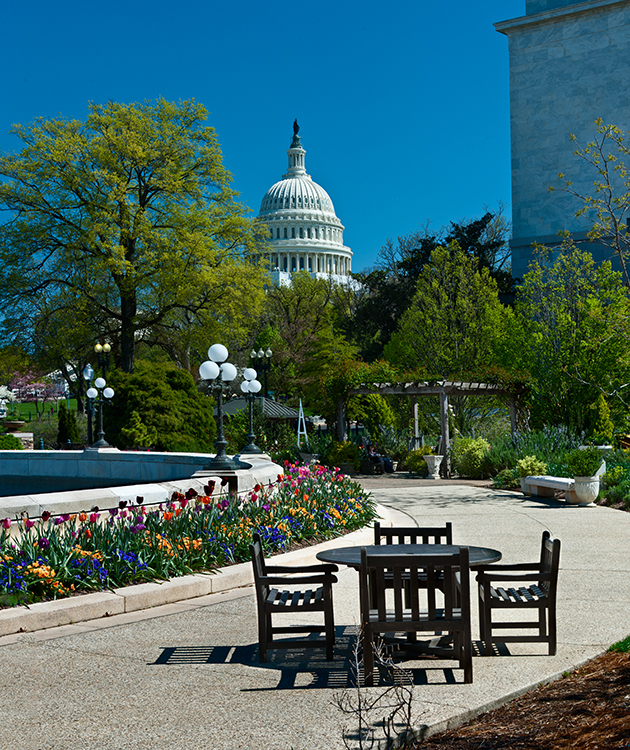 Located in the park between the U.S. Capitol and Union Station. Stacy Fischer’s blog Visual Venturing hosts the weekly After-Before Friday Forum that provides a unique opportunity for photographers to exchange ideas about post-processing their images. I have found these exchanges to be extremely instructive. This week’s Forum will be up later this morning and can be found here. The image above obviously does not show the dramatic lighting and dark clouds, so some adjustments were necessary in Adobe Camera Raw (ACR). The screen capture of the ACR dialog window below shows the adjustments that were made (Exposure: -0.30, Whites: +19; Blacks: -44; Clarity: +26; Vibrance: +24). These global changes brought the scene closer to what I was seeing when I took the picture, but a little more work was needed and I moved the image into Photoshop. The sky was still too light and the golden color of the sun was too understated. 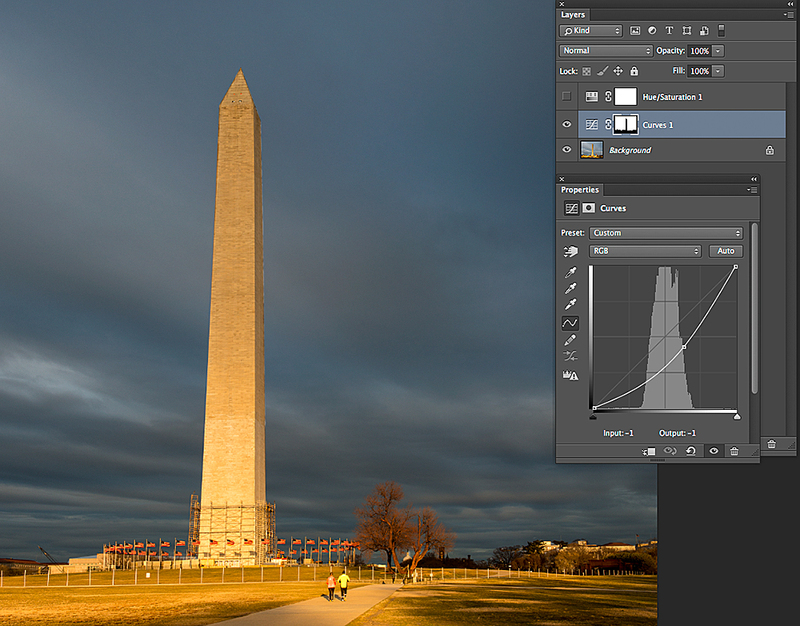 The first step was a Curves Adjustment Layer to darken the sky. The screen capture below illustrates this step. 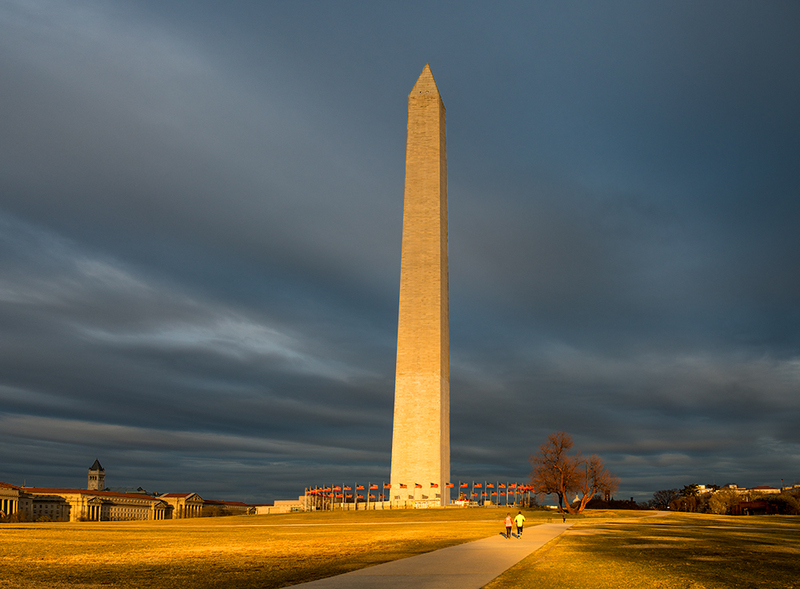 The foreground and the monument were masked so the adjustment only affected the sky. The second step was to correct the color of the sunlight on the scene and this required only a modest increase with a Hue/Saturation Adjustment Layer. The screen capture shown below illustrates that adjustment, an increase of only +8. Given the small size of this image, the difference is hardly noticeable, but in a large print, it would make a difference. 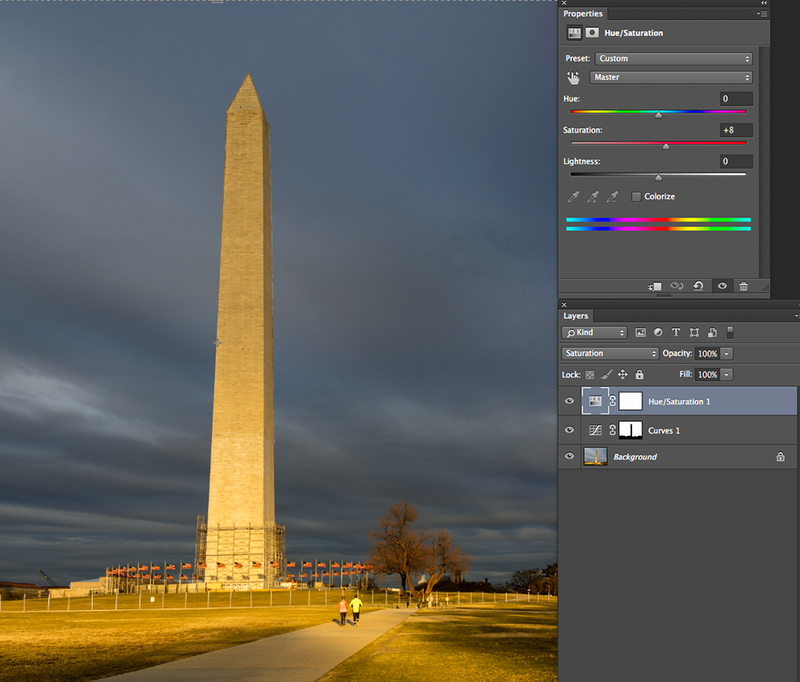 The blend mode in both adjustment layers was Normal. I don’t usually select that mode, but I always check to see the effect and in both cases, I preferred the effects of Normal instead of Luminosity for the curves layer and Normal instead of Saturation for the Hue/Sat layer. The results of these steps are shown in the image below. It is a faithful rendition of the scene as I saw it when I took the photograph. But there is still a problem, and a fairly serious one. While not terribly obvious in this small size, a full screen version on a 27-inch monitor clearly reveals the presence of a considerable and annoying amount of construction paraphernalia. The image below gives a better sense of the scope of the problem. I guess this is what they call an ethical conundrum. If this image was to be printed in a size (e.g., 18” X 24” or larger), the construction activity would be obnoxious. I decided to give it a try, rationalizing that it would be a learning experience. What I did not bargain for was that this “learning experience” would last for nearly three days. Lacking knowledge of any elegant solution, I applied the Photoshop equivalent of brute force. Only 3 Photoshop tools were used to remove the offending material from the site and none will be a surprise to Photoshop users. They were the Healing Brush, the Clone tool, and the Edit>Content>fill procedure. The first two are well known actions to remove flaws or unwanted objects from a scene. The third is less well known but often can be an incredibly powerful assistant as the photographer changes roles from faithful recorder of reality to creator of something that never existed. The result of these efforts is shown below. Not all evidence of the renovation was removed as is shown in the detailed section below. While the “cleaned” version seems to be an improvement, it’s reasonable to ask if it was worth the effort. Comments on the results are most welcome and thoughts on the ethical question would also be interesting to hear. Please visit Stacy Fischer’s post with the submissions of some very talented photographers when it appears later this morning. The opening is about 15 X 20 feet and the trick was to get pretty close, but not too close. Using a 14-24 wide angle would require getting a little closer than I considered wise. And the results didn’t capture the drama as well as I would have liked. 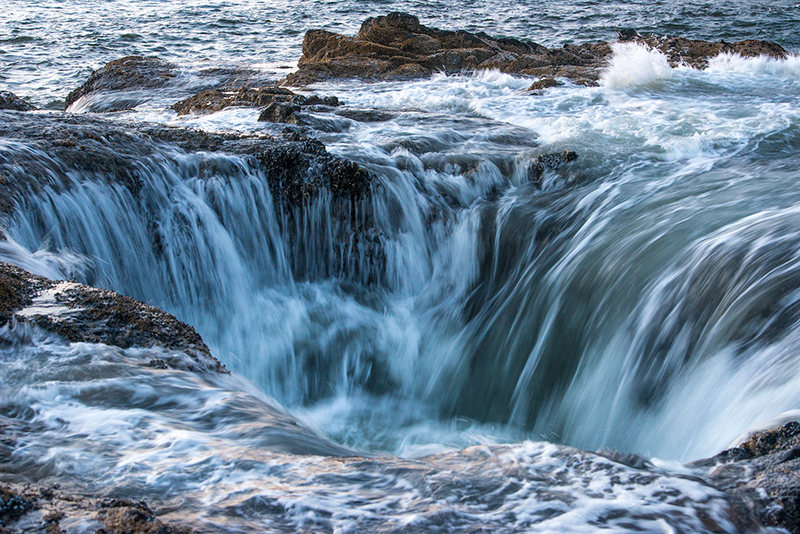 I was looking down into the mouth of this abyss and the wide angle made it seem the view was from 100 feet away. I switched to the 70-200 telephoto and liked what I saw at 70mm. Cropping out the horizon was a conscious decision. After opening the image in Adobe Camera RAW (ACR), I made a number of adjustments to open up the darker segments and restore the subtle warm tones that I had seen when taking the picture. The Figure below shows a screen capture of the ACR window with the adjustments I made (red arrows). 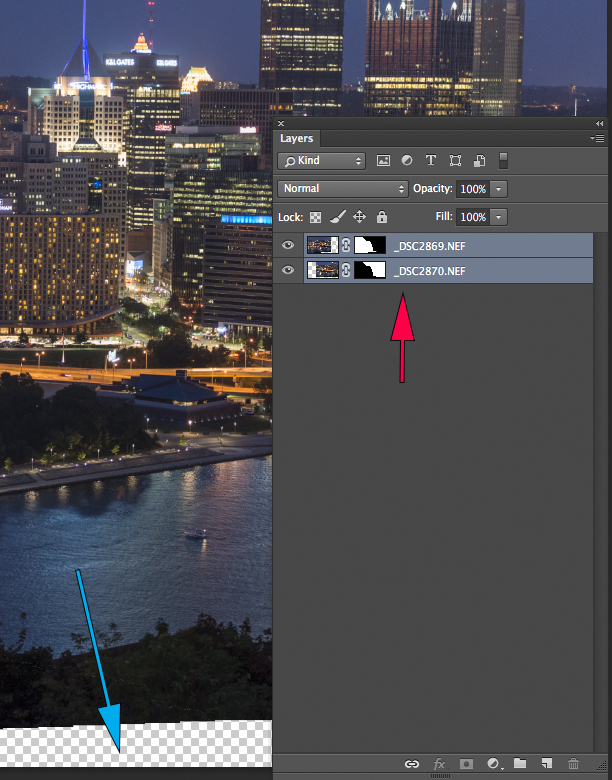 The next step was to open the image in Photoshop and the image at this stage is shown below. It seemed to be about where I wanted it, but it needed just a touch more saturation. 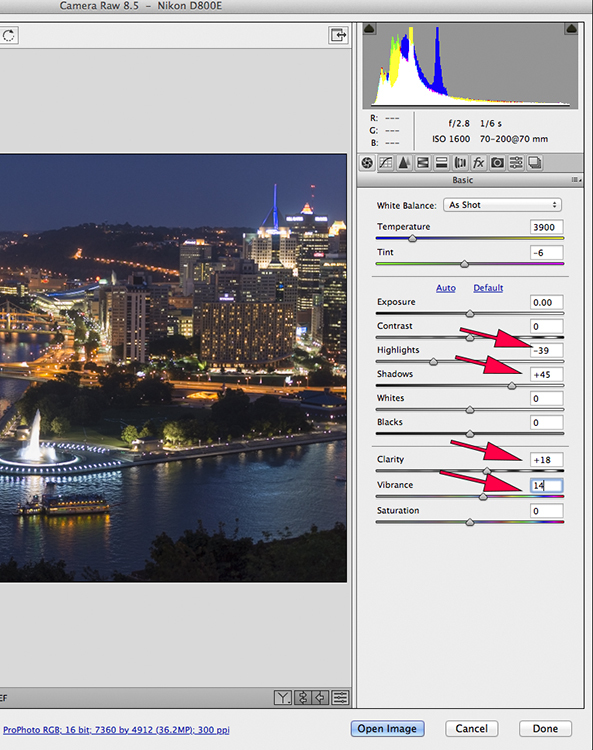 As a final step, I added a Hue/Saturation Adjustment layer as shown in the Figure below. I moved the slider to plus 33 (red arrow) which brought out the blue of the water in shadow and the warm touch of sunlight on the water in the foreground. The blend mode (blue arrow) was set to Saturation. That was it. 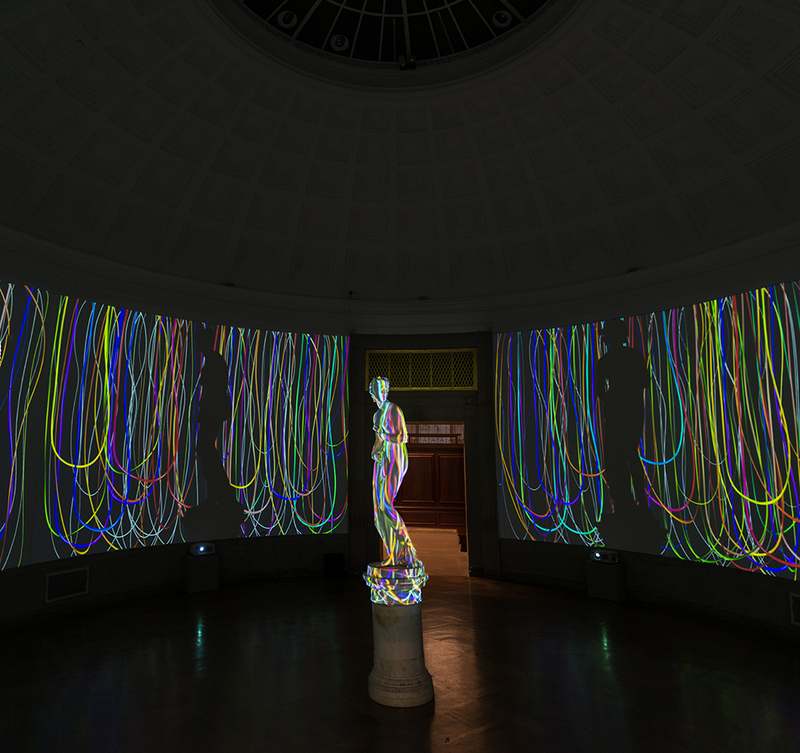 The final image is shown below. The overall time required was about 15 minutes, a lot less complicated than the star trails image from last week. While visiting New York City last year, I visited the 9/11 Memorial. In observation of this day, I thought I would post two pictures from that visit. The first, a panorama, gives an overview of the Memorial. As I walked along the railing, I noticed a yellow rose placed in the engraving of one of the victims’ names, shown in the second image. 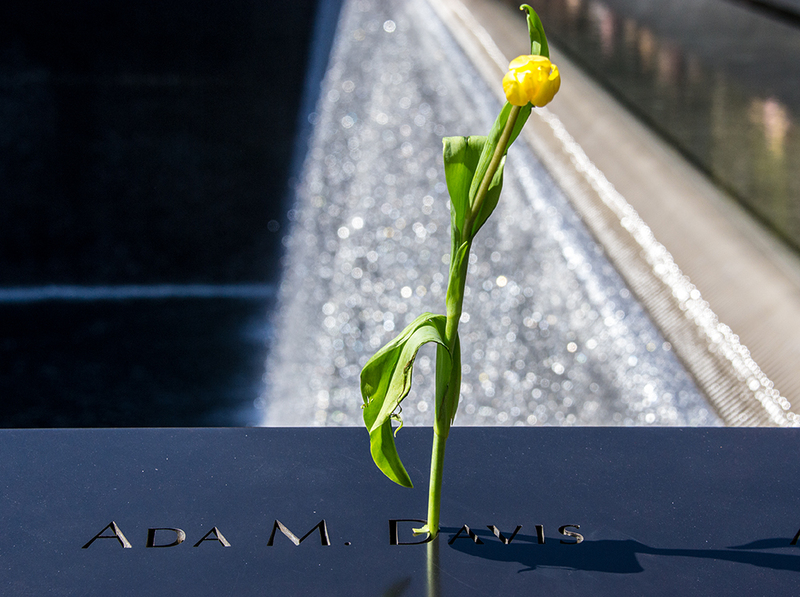 I later learned that the name, Ada M. Davis, was a civilian working in the Pentagon and was one of those killed when Flight 77 struck the building.